Size: 6.1" x 5.3" x 1.8"
The Canon Canola L813 is another calculator based on the TMS1000 Microcomputer family. The TMS1045 found inside the L813 and used with the Toshiba BC-8111B is simlar to the calculator Integrated Circuit of the TI-2550-III. The housing is very similar to the earlier Canola L812 and L1010. In the same year the Canola L-3 was introduced with 12-digit calculating capacity instead the 8-digits found in the L813. The L813 was a very successful calculator and in 1983 a redesign changed both the keyboard layout and nternal construction. Don't miss the L813 II. BTW: Does this calculater looks like a scientific one ? It could, depending from your soldering skills. 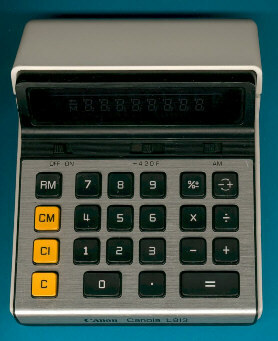 It uses an identical calculator chip like the Palmtronic F-31.